Life on two wheels: Conchscooter prevails with panache!!! On a Vespa you'll get away with anything. It's the Italian way... always with brio! Was wondering about that. Good to hear both are okay. It was it was worrisome that there was no information coming from the Keys coupled with the serious damage reports that are surfacing. 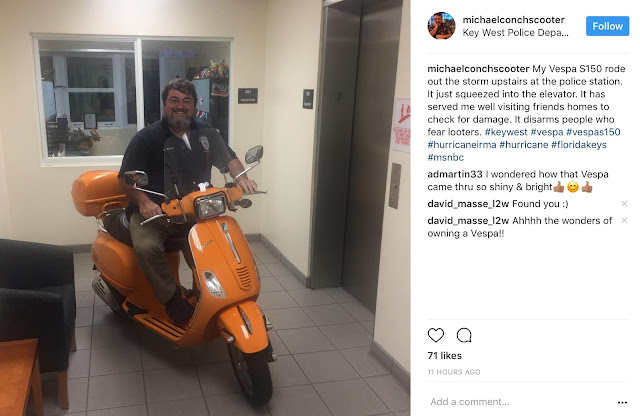 Glad to hear that Conch and Vespa made it through the storm. Thanks for the update! My pleasure. Conchscooter is now a bona fide legend, if he wasn't already. Thank you for the worry. The daily grind continues. It’s no doubt a comfort to know that your welfare is a concern that spans the US and Canada.